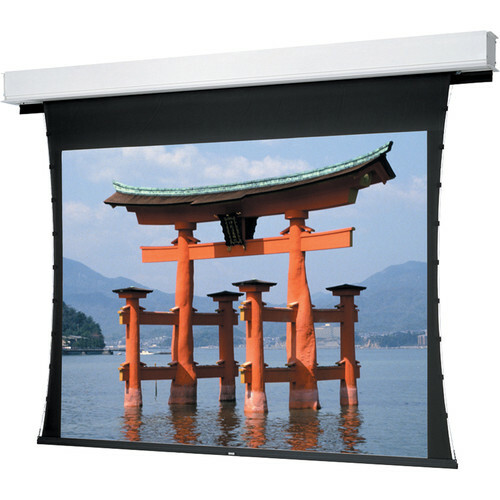 The Dalite 65x116" Advantage Deluxe Tensioned Motorized Front Projection Screen is unique in its design. It is manufactured to be installed during the construction phase of your media, class or board room. Afterwards, the fabric is added to complete the set-up. This stylish ceiling recessed screen is for those who don't want the screen showing when it is not immediately needed but available at the flip of a switch. For easy installation, the Tensioned Advantage Deluxe is available with SCB-100 and SCB-200 (RS-232 serial control board) or Low Voltage Control unit built into the case. Tensioned models are made with a thin vinyl surface that is stretched to assure a perfectly flat surface. Non-tensioned screens are fiberglass and not as taut as tensioned models.. Deluxe models have a door that opens and closes, Non-Deluxe models have a 2" slot. Box Dimensions (LxWxH) 150.0 x 13.0 x 10.0"